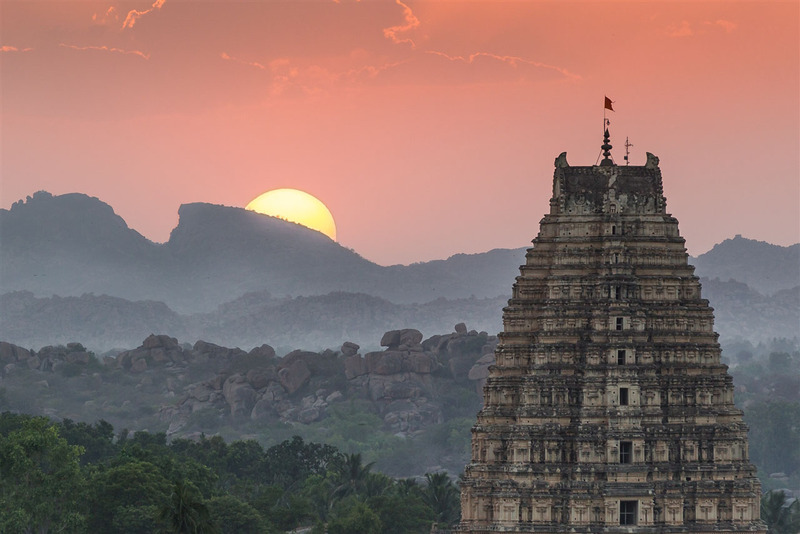 Long before I visited Hampi I knew it was potentially a great location to photograph sunset. 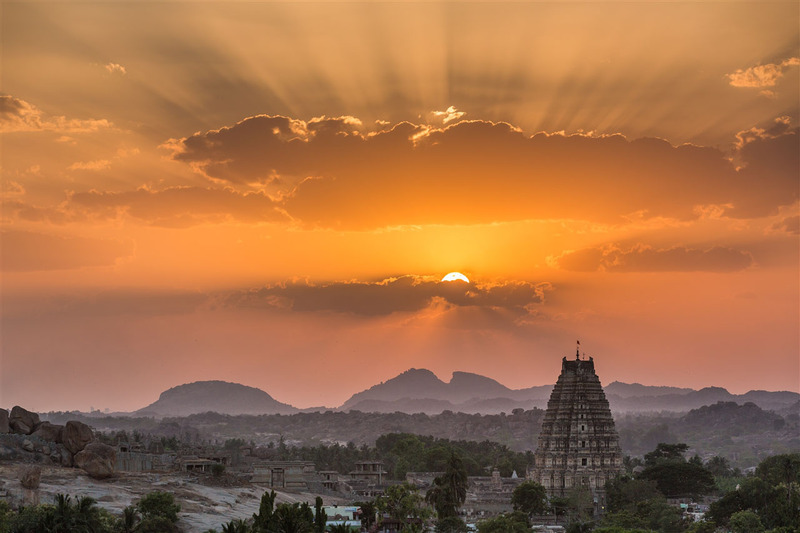 You only have to google “hampi sunset photos” to see what I mean. But in many of the photos I poured over online, the sense of drama just wasn’t there – everything seemed too far away. Most people seem to head up to the summit of Matanga Hill and the proclaimed “sunset point”, but I decided to try something different. On my visit to Achyutaraya Temple earlier in the day I had scouted a path that seemed quite promising. It traverses around the northern side of Matanga Hill but is lower down. 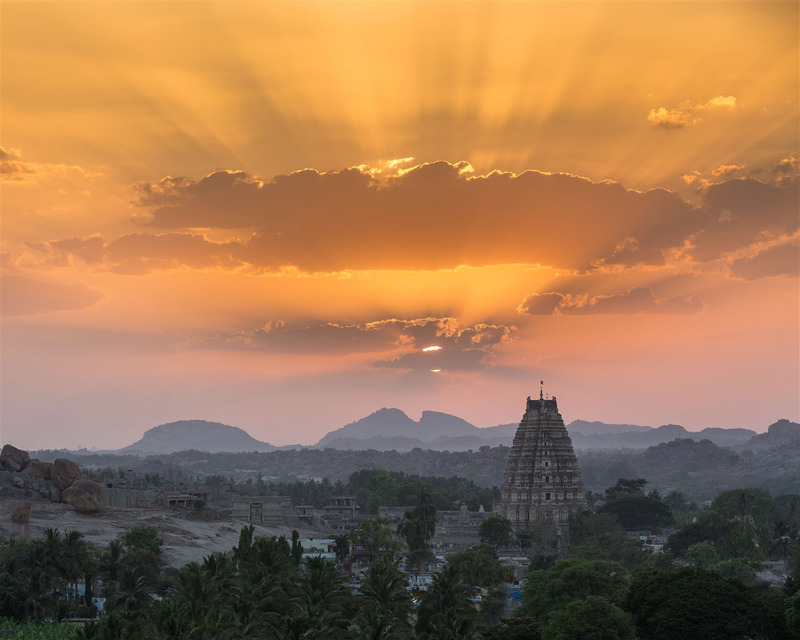 This was key for me as I wanted to ensure the Virupaksha Temple was a focal point of the shot as well as the sunset itself, the temple needed to be prominent and not just lost below the horizon. There’s a more detailed description of the location I chose at the end of this blog. The actual spot I chose was about 10m north of path, a little scrambling was called for, but it offered exactly what I was looking for; the temple gateway rising up and prominent in the scene, the hills behind, and hopefully the actual sunset in the frame as well. I arrived early, so wasn’t entirely sure it was going to work, but in the end I got lucky. 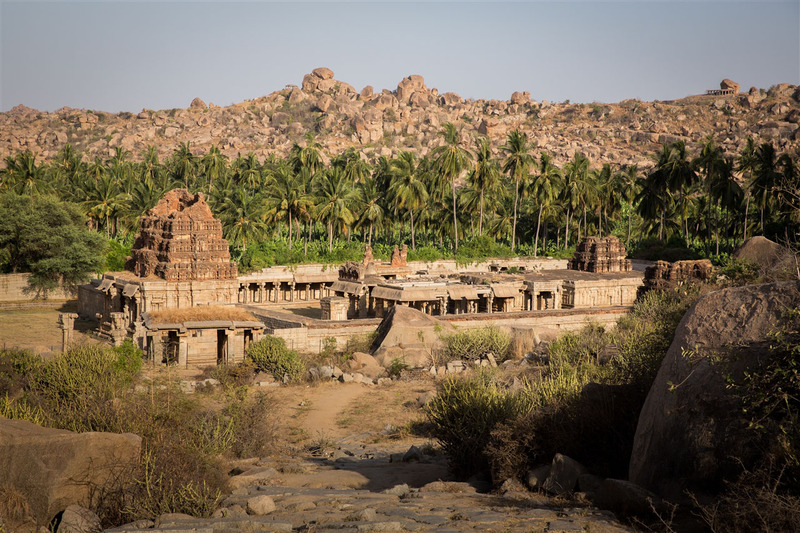 With the sheer volume of boulders that are all over the Hampi landscape no tripod was needed. I just rested the camera on a beanbag on a chest high rock and I was all set to go. It sounds all too clichéd I know, but it was a magical experience to stand there and watch the sun slowly dip behind the temple and the hills beyond. The Virupaksha Temple had been with me for almost the entire day, a reassuring beacon on the landscape. It seemed only fitting that I should conclude an amazing day by watching the sunset behind that temple. So, how do you get to this place ? There are two ways to reach the location, depending on the direction of your approach. Take the path heading west from Achyutaraya Temple that climbs and skirts the north side of Matanga Hill. If your sense of direction isn’t that great, after walking for about a minute look back and this should be what you see. Hopefully that should ensure you’re on the right track. Walk to the far eastern extent of the ceremonial street, with the Virupaksha Temple behind you. At the end is a pavilion sheltering a large monolithic image of Nandi. To the right is a stepped path that leads up through an open gateway and on towards Achyutaraya Temple. Here’s the location on google maps, which might make a bit more sense of the directions. BTW, when will you come to China? I’m looking forward to meeting you at Beijing. What a shame ! But a good excuse to return there one day, not that many excuses are needed ! Thanks…I’m keen to return to Hampi soon, it’s an amazing and unique place ! Thanks for stopping by ! Hi Vinod – thanks for your comment. I’m hoping to return to Hampi soon ! I had to look Hampi up to figure out where it was. We were in India and Nepal for just three weeks, and I (sadly) didn’t get there. It looks absolutely wonderful, and your photos are stunning! Keep up the wonderful work! Nice shots. 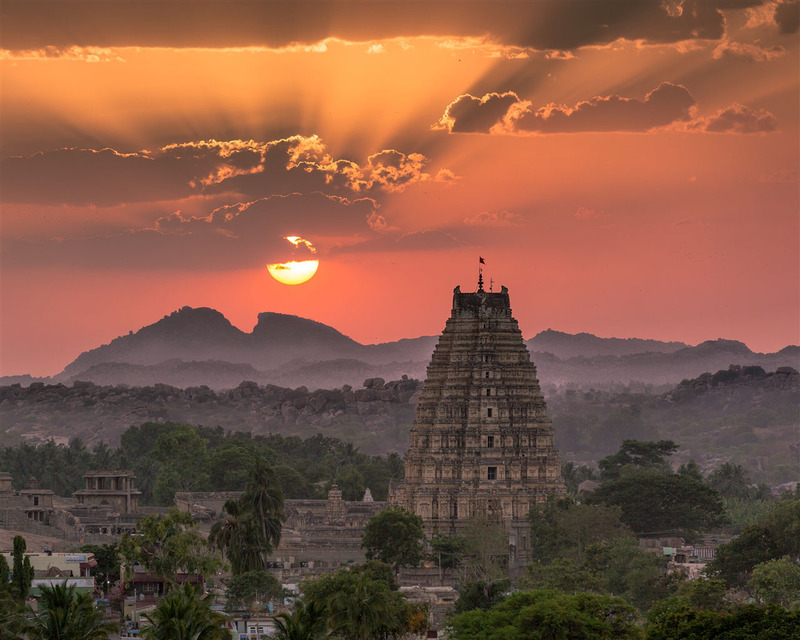 India provides fantastic sunrise and sunset opportunities. 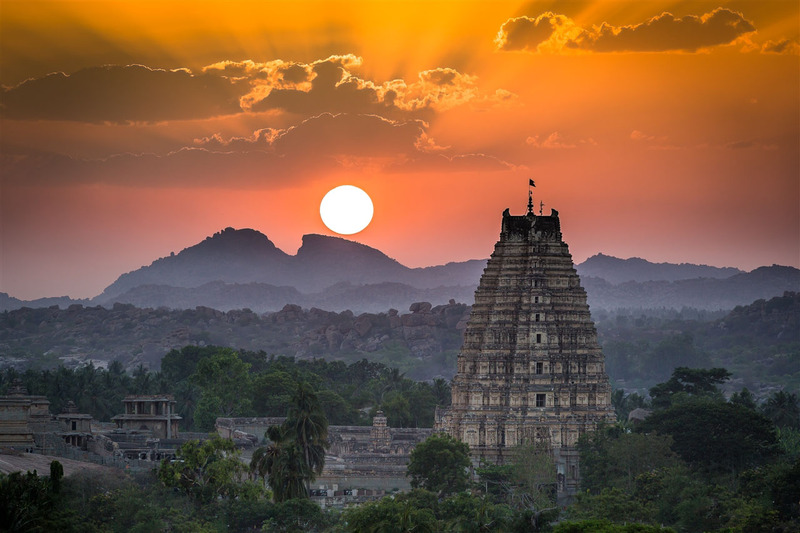 Hampi is on my future bucket list. Thanks for sharing! Hampi is simply amazing, somewhere I would like to return to soon. Hope you manage to explore it some day. Thanks for stopping by ! Great stuff Kevin. Hampi is an extraordinary place. You made me want to go back. It is an extraordinary place, I’m also keen to return and spend sometime in the wider landscape. There’s much to be explored there ! Thanks for stopping by ! Hi Jim, have just checked and it was the Canon EF 70-200mm f2.8L IS II USM. 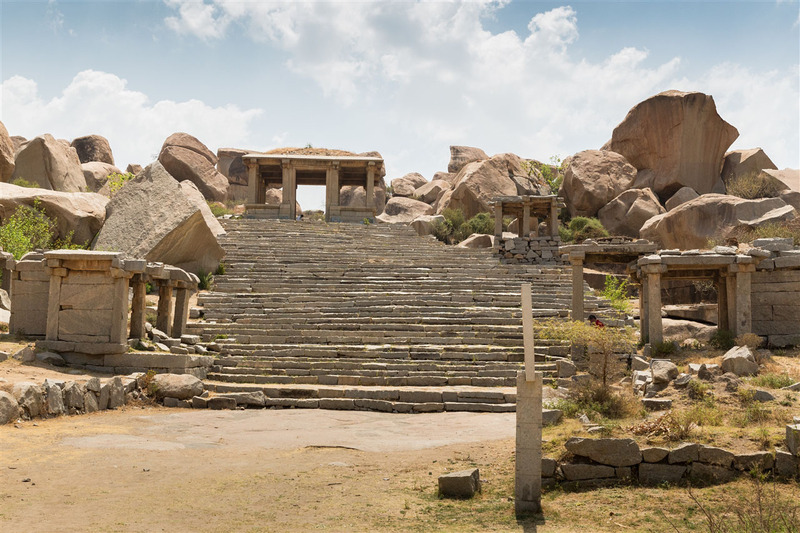 Enjoy Hampi, it’s a lot to see in just one day ! Also, what camera do you use? Thanks for the info, Kevin. Dear Kevin, I am a regular visitor to Hospet (at least twice a month) because we plant is there. 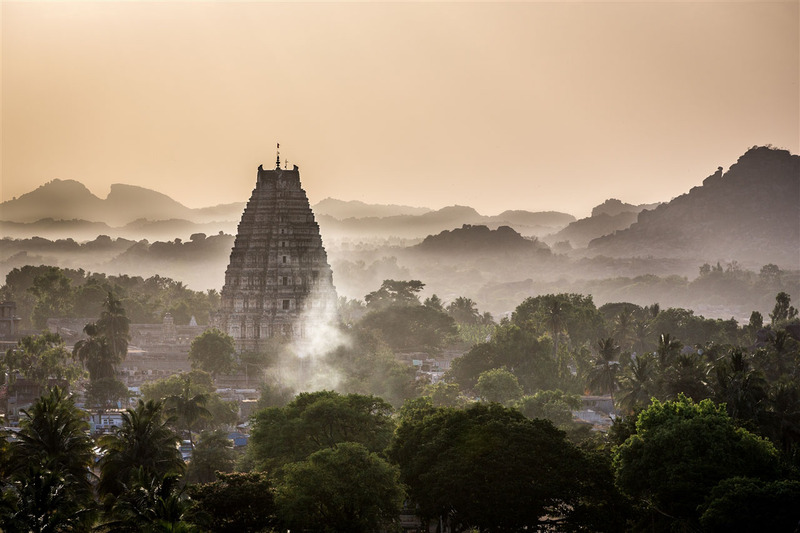 I visited Hampi many times with all my camera gears but never had been to this spot. Thanks for showing amazing place. 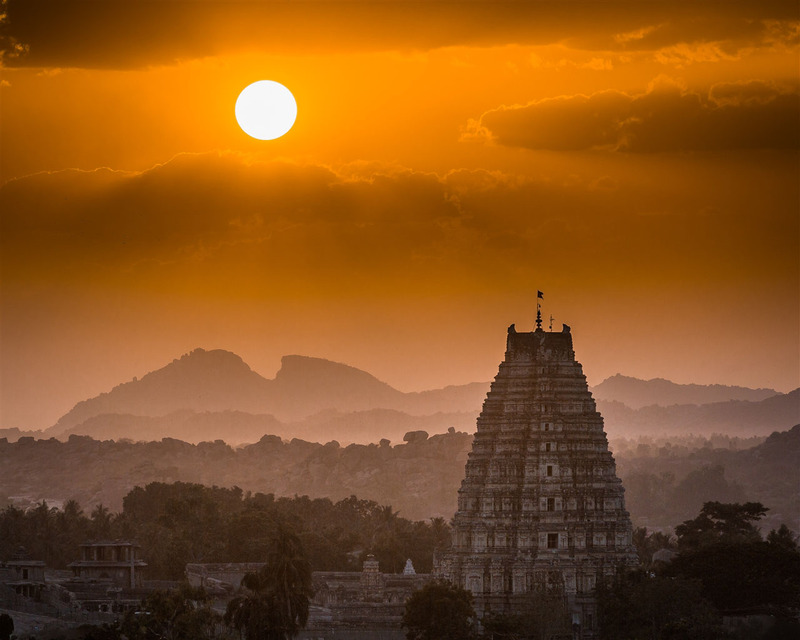 Now this Sunday, 14th Jan I will be going to Hampi for a week & will try to capture sunset during my hectic schedule. Photographs are very nice & stunning. I have Canon 7D Mark II with the same lens (70-200 mm). But I think to shoot with wide angle lens also. What’s your views on this? Any other special advice please. Thanks Kevin for your valuable inputs. Will share my experience.